La Cañada, CA — Aerin Holt of California Contemporary Ballet (www.CalBallet.com), the originator of the popular ballet “The Snow Queen,” has created a production she has long dreamed of: a full-length ballet adapted from Hans Christian Andersen’s story “Thumbelina.” Jaclyn Stryker, a professional dancer and resident of La Crescenta, stars in the title role. Jaclyn Stryker warms up in a corner of the studio, quietly wincing at the pain from a sore muscle in her hip. But, continues to extend her right foot high above her head and stretching it around into an arabesque. Ms. Stryker, a resident of La Crescenta, has recently returned to her roots in Los Angeles’ foothill communities from San Francisco, where she performed with several professional dance companies. When Ms. Holt first spoke of the idea to friend and prolific classical composer Dwight Bernard Mikkelsen of Lakeview Terrace, Mikkelsen loved the idea, and immediately began composing music in earnest. “I was very impressed with his musical interpretations,” says Holt. Ms. Holt is largely responsible for the ballet's choreography, but she was delighted to collaborate with Lynn Bryson Pittenger on certain sections of the ballet, very much including the delivery of the final scene: Thumbelina's arrival at the Vale of the Fairies. This is the scene in which Holt plans to create the essence of a fairy world. Thanks to donations and volunteer contributions of work and materials, the sets will indeed include ten foot tall flowers, some five foot toadstools, and the famous tulip from which Thumbelina is born—which will actually open its petals to release her onto the stage. 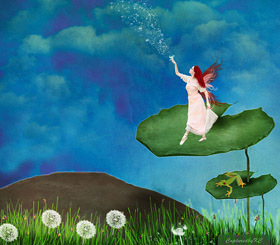 “The story of Thumbelina is certainly a child's fairy tale,” maintains Holt. “However, through quality music, choreography and dancing, it can be told with depth and emotion so adults can appreciate it as well.” With a melding of contemporary dance, classical ballet and aerial arts, this performance is an excellent choice for the entire family. 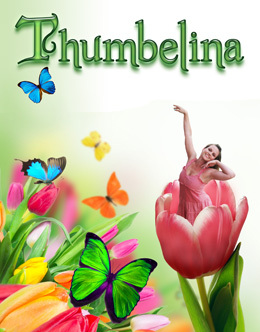 “Thumbelina” by California Contemporary Ballet Los Angeles premieres at Glendale Community College (1500 N. Verdugo Road, Glendale, CA) on June 29th at 7:30 PM, and on June 30th at 2:00 PM. 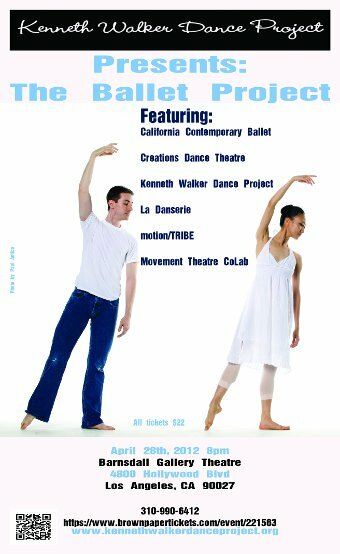 Tickets are $20–$30 at www.CalBallet.com. Group tickets are also available. California Contemporary Ballet is pleased to announce our newest ballet, Thumbelina, a full-length ballet based on the story by Hans Christian Andersen, with original choreography by Aerin Holt and original music by Dwight Mikklesen. California DanceArts encourages all students and dancers to participate in, and take advantage of, this new opportunity. If you had the good fortune of participating in CCB's The Snow Queen ballet this past December, then you know what a joy it is for both young and mature dancers to take part in such a production. As you will soon discover, our Thumbelina will present dancers with yet another rewarding performance opportunity. Illustration by CapturedbyKC. Some rights reserved. California Contemporary Ballet June 28-30th at Glendale Community College Theater. previous production, The Snow Queen. Auditioning children must be currently enrolled in weekly ballet classes and must bring a recommendation from their current instructor. Young Chorus are girls and boys UNDER 11 years of age. * Dew Drops (no taller than 44 inches) – Children must be able to skip well to be cast in any role. Members of California Contemporary Youth Ballet will perform multiple older chorus roles. We are looking for new members for our company and additional dancers for certain roles. The Fairy of Confidence, and a trio of Flower Fairies. ALL dancers at all auditions should bring photo, résumé, $5 audition fee (not required for professional dancers), dance attire and ballet or Pointe shoes. Everyone will audition in groups. Please arrive early for sign-In. 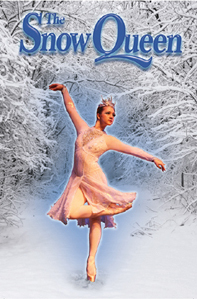 La Cañada, CA: California Contemporary Ballet (http://www.CalBallet.com and http://www.SnowQueenBallet.com) will present the 15th anniversary showing of the original ballet “The Snow Queen,” with three shows on December 21st, 22nd and 23rd. The ballet, first shown in 1998, is the brainchild of Artistic Director Aerin Holt and composer Randall Michael Tobin, and is based on the classic tale by Hans Christian Andersen. For 15 years, Aerin Holt has served as Artistic Director of this holiday classic. With sold-out performances each year, Ms. Holt and her Company might be inclined to wax nostalgic, but they show no signs of slowing down. Instead, they are gearing up for a dazzling anniversary extravaganza to mark their 15th season at the Glendale Community College Theater, with an evening performance at 7:30pm on December 21st, and matinees at 2:00pm on December 22nd and 23rd. In 2007, Holt took her dance company, California Contemporary Ballet, which had previously been a youth company, and converted it into a professional dance company with professional dancers. Together with its existing youth company members, the performing troupe put together an artfully integrated cast for “The Snow Queen” comprised of professional and youth talent to fill the principal roles of the ballet. Each year since then, the professional company dancers are supported by dancers, actors and gymnasts from the community in chorus roles, resulting in a 65-member cast from Los Angeles and the local communities of Burbank, Glendale, La Cañada Flintridge, La Crescenta, and Pasadena. This year, “The Snow Queen” will feature new professional talent performing the starring roles including Lauren Farrell (from Burbank), who was personally selected by Holt to perform the title role of the Snow Queen. In an effort to keep the show fresh, Holt continually changes many of the roles and conducts auditions every season. “In fifteen years, we’ve had fifteen casts,” Holt boasts. She also enjoys reworking the choreography to fit the talent of her cast members. While The Snow Queen may be touted as a ballet, Ms. Holt infuses each performance with classical and contemporary dance styles that weave together the classic winter-time tale by Hans Christian Andersen. Further changes to the production have included the introduction of aerial arts, where “creatures” resembling wolves, panthers, leopards and other wild animals perform on hanging silk scarves as the Snow Queen delicately balances 40 feet in the air on a hanging hoop. Indeed, Ms. Farrell finds the aerial aspect of her role to be challenging. A trained ballerina, Farrell is getting a crash course in aerial ballet. “I’m really excited and look forward to performing aerial. An opportunity to learn and to perform a role like this is exciting”. Holt set out to create a new ballet tradition and the Company’s 15-year evolution is living proof of her success. A cursory search of the internet reveals that the Snow Queen has grown in popularity as more companies appear to be producing the story as either a ballet or play. Holt firmly maintains that her Company blazed a trail by being the first to adapt the story for ballet, and it has evolved into an annual December production much like the Nutcracker. 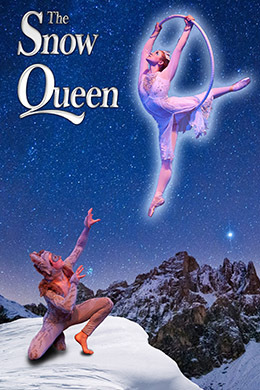 California Contemporary Ballet’s Snow Queen has become a community favorite for the holidays and offers a seasonal, family-friendly alternative to the myriad of Nutcracker productions, at affordable ticket rates. The Snow Queen will appear at the Glendale Community College Theater on Friday, December 21 at 7:30pm, Saturday, December 22 at 2:00pm and Sunday, December 23 at 2:00pm. Tickets in advance: $20-$25 At Door: $25-$30 Discounts available for groups. Tickets are available at http://www.SnowQueenBallet.com or http://www.CalBallet.com or by calling 818-790-7924. Summer 2007, the fortunate students of California DanceArts located in La Canada, CA, prepared for the ultimate summer experience with a 4 week program provided by the Los Angeles International Ballet Intensive. Foreign students from as far away as Mexico, Canada and France joined local students to study with the school’s faculty including guest teachers Molly Lynch and Israel Gabriel from the University of California Irvine, Preston Lee from the National Ballet of China, jazz teacher Steven Woodruff and Aerialist Rachel Bowman who introduced students to the exciting new world of aerial ballet. Ten students from the LA intensive were chosen to participate for another challenging four weeks in the city of Ostrava, Czech Republic. I was honored to be an invited guest teacher and choreographer in coordination with the Prague International Ballet. The students and I were given the opportunity to work with an amazing faculty including Igor Vejsada-director of the Ostrava Ballet and Yehuda Maor, former principal dancer of Bat Dor Dance Company. Furthermore, California Contemporary Ballet was invited to perform works of my original choreography for their own evening at the famous Janacek Conservatory. The work was entitled, “Blind Journey” and debuted in Los Angeles earlier in the year. Upon seeing the choreography, Maor felt that the audience in Ostrava would welcome the company. Soon after, an invitation arrived for the company to perform. The evening was captured on Czech television. It was a glowing evening for all. A few days later the dancers performed along with other students from the workshop with an array of choreography from the workshops stellar faculty. Days of site seeing with visits to Prague Castle and St. Charles Bridge ensued before returning home for a break before classes at California DanceArts started again for the fall. I don’t think any of us will forget our experience in the Czech Republic. Salzburg, Austria is a city rich in history and culture. It was home to Mozart and has since become the modern-day cultural mecca of Europe. The majestic Alps provide an amazing backdrop for the steeples erected in the traditional style of European architecture that comprise the skyline of Salzburg. Being surrounded by such breath-taking beauty and culture, what young musician, dancer or poet doesn’t dream of one day performing on the stage of one of Salzburg’s many grand historic theaters? This past summer, nine dancers from California DanceArts were given such an opportunity. Accompanied by ten other dancers from across the country, these fortunate dance students were to participate in a rigorous 4-week dance program offered by the Salzburg International Ballet Academy or SIBA. I had been given permission to select dancers to the workshop by audition. Upon our arrival in Salzburg, we American dancers were joined by nearly 20 additional Intermediate to-professional level dancers from all over Europe to take advantage of this advanced training. I was flattered to receive, and indeed accepted, an invitation to join the ranks of an array of world-renown dance educators and performers to serve as a guest instructor. Each guest instructor was given the opportunity to teach a variety of master classes and lectures to the attending students. One such star of the summer program was the famous Maya Plisetskaya who became a principal dancer of the Bolshoi Ballet in 1943. She became and remained the company’s prima ballerina throughout the 1960’s and was awarded the highest honor of Prima Ballerina Assoluta, thereby establishing herself as one of the 20th century’s greatest ballerinas. Students were given the rare opportunity to meet and attend a lecture given by Ms. Plisetskaya. Having the distinct pleasure of seeing her dance and demonstrate movement was an event these students are unlikely ever to forget. Now in her 70’s, she is still very agile as she demonstrated, with ultimate grace, the amazing port de bras, a type of movement with the arms for which she became famous while performing such dances as the Dying Swan. The students worked arduously in daily dance classes, followed by evening rehearsals with international ballet stars and principal dancer with the London Festival Ballet and American Ballet Theatre. Guest teachers prepared students to perform variations from many ballet classics such as Giselle and Don Quixote in preparation for the closing gala performance. Despite these physical demands, the dancers mustered the energy to tour Salzburg’s old city with its grand churches overlooked by a fortress situated high on a mountain. When time allowed, many students relaxed at the outdoor cafa’s and pubs and several took advantage of the many interesting shops offered in the city. Several California DanceArts students also took the rare opportunity to accompany me on weekend excursions to Vienna, Austria and Venice, Italy. Notice the photo of happy travelers in Venice! On our final day, students were delighted to see the residents of Salzburg fill the seats as dancers prepared for their performance, marking the end of the summer intensive program. Several California DanceArts students were awarded soloist roles and were highlighted in the program. At its conclusion, tearful good-byes and hugs were exchanged as we climbed into shuttles, prepared to whisk the dancers to the airport for the 15- hour return flight back home. Armed with newly acquired skills, an immersion in a new culture, plenty of souvenirs and a touch of German in our vocabularies, these dancers and this teacher will forever continue to reminisce about this Experience of a Lifetime. Maya Plisetskaya and her husband the composer Rodion Schdedrin, where the honorary guests at the Salzburg International Ballet Academy 2005 Summer Workshop. Ms. Plisetskaya viewed classes, gave lectures and provided students with the rare opportunity to meet one of the 20th centuries greatest ballerinas. Maya Plisetskaya also signed copies of her autobiography bestseller, “I’m Maya”. Lasting Memories Of Your Favorite Dancer! Snow Queen Prints Available for Purchase! Beautiful photos were taken during last year’s production of The Snow Queen—performance shots, rehearsals, backstage shots—by Kathy Hanson Photography and are now available for purchase! Hundreds of photos of the 2011 Snow Queen cast are available. You can order prints in various sizes and formats—small, large, glossy, matte, framed, canvas, etc. You can even get t-shirts, mugs, playing cards, etc with the images of your child or favorite Snow Queen cast members! Add your choices to your cart and choose the format. Prices will vary depending on size, format, etc. 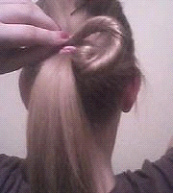 It is part of good traditional ballet training to learn to create a proper ballet bun and to learn to do it quickly. California DanceArts requires all students to have their hair fastened securely out of the face and off of the neck. Young ladies should have nice pretty ballet buns in class just as they must have for performances. It is a matter of creating good habits for performance and giving dancers the opportunity to work without the distraction of hair in the face and eyes. Some movements are thrown off by the weight of the hair when it is loose. Although not acceptable for performances, occasionally when you are really in a bind– running late to class or mom is away and dad is left to handle the bun making, for instance–there are handy “Bear Claw” clips that can be purchased at any drug store. By twisting the hair up as described above and securing it with the ‘Bear Claw,’ the bun is made fast and secure without bobby pins. Brush your hair; make sure that there are no tangles. 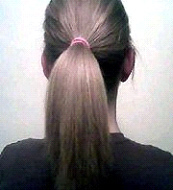 Pull back into a ponytail using a comb or brush to remove the bumps. 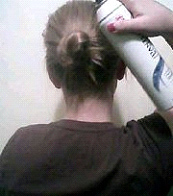 If necessary, spray the hair with a quick-drying hairspray (an inexpensive brand is okay). You have already used a comb or brush to remove the lumps, so now you can use hairspray (optional, depends on the style of your hair) to smooth with your hand all of those wisps up and into the bun. Put an extra rubber band around your ponytail, just for extra security. It is important to have a strong foundation for your bun so it doesn’t fall down. Separate hair into 2 equal sections. Take one half and twist the whole strand together, tightly. 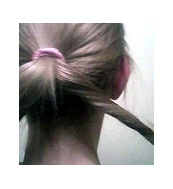 Tightly wind the strand of hair around the ponytail holder, as if curling around it, not over it. You should probably use heavy-duty hairpins such as Scunci Bobby Pins to hold up your hair. They are about $2.00 for 18. Most people find that an actual hair pin versus a bobby pin can hold their hair better. You will want to get the thicker kind, especially if you have thick or curly hair, because the thin ones are easily bent out of shape. Securely fasten the hair. You can do this by putting a bobby pin in like your bun like it was a clock. 12 o’clock, 3 o’clock, 6 o’clock, and 9 o’clock. If the first half of your bun feels a little shaky, put more bobby pins in where desired. Repeat these same steps for the second half of your ponytail. If there are any wispies, or frizzies, lightly spray with hairspray, all over. There are a lot of videos on the internet that show this process and additional tricks to help you. Just do an internet search for “Ballet Bun”. LOS ANGELES, CA: California DanceArts, (http://www.caldancearts.com) will be holding auditions for its Los Angeles International Ballet Intensive and its Youth Ballet Intensive on April 14th for the 2012 Intensives. 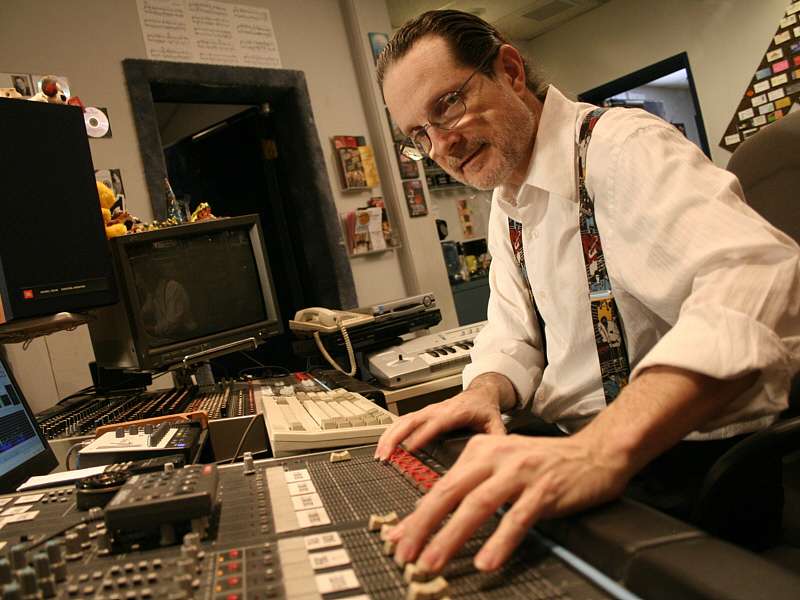 Auditions will be held at the main studio in La Canada, located in the midst of Los Angeles. The intensive will take place in July, running from the 9th to the 28th, and attending students will get the chance to literally go global, by taking advantage of opportunities to attend foreign dance programs through the Global Ballet Workshops. Limited attendance only. The advanced curriculum of the Los Angeles International Ballet Intensive has brought it much acclaim, including from such organizations as the Ostrava Ballet in Prague. It has also garnered an international teaching faculty with instructors hailing from such companies as the Laine Theatre Arts in England, the New York City Ballet, the San Francisco Ballet and the Joffrey Ballet. The curriculum will include classical ballet, contemporary, pointe, special conditioning and placement classes and even aerial ballet, culminating in a performance by the students. In addition to the above international faculty, dancers will, of course, receive instruction from California DanceArts founder and artistic director, Ms. Erin Holt. A Youth Ballet Intensive will be hosted as well in the Los Angeles studio of California DanceArts. Students at an intermediate level (the approximate age group is 9-12) will be able to hone their skills in such traditional fields as classical ballet, pointe preparation, and conditioning, but also in more varied themes such as modern, jazz, improve, and aerial. Unique in the program is a Choreography Workshop where young dancers can begin to learn to not follow choreography but create it themselves. Since 1987, California DanceArts has been dedicated to the purpose of grooming and nurturing the talents of beginning to serious career dance students. Its current location in beautiful La Canada is among several schools and recreational facilities. 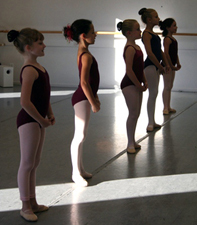 More information on California DanceArts 2010 summer dance workshops can be seen at http://www.danceallsummerworkshops.com. The school’s blog can be seen at http://caldancearts.typepad.com. For more information about California DanceArts and the programs offered by the school, call 818-790-7924, or visit the school online at http://www.caldancearts.com. Children who are planning to attend summer school or other activities can still enjoy going to dance camp! This after-school camp will keep young dancers moving all summer long!. Click here for program info. Our child princesses, Cinderellas and Sugar Plums will quickly develop creative abilities, learn basic ballet skills and will enjoy this magical experience that revolves around theatrical story telling and student reenactment of a fairy tale or ballet. Click here for program info. Open to intermediate and advanced dancers, we feature a new guest teacher each Saturday. Click here for program info. See website for schedule of classes & times. Beginners welcome! Students may enroll in one to four classes per week, or can dance endlessly with unlimited classes, depending on age and ability. See a description of all the classes offered at California DanceArts by clicking here.